This post - Tribe Building - had me thinking. I have been involved in a Master Mind group since 2003. It has been a way to push me and a way to get support. One of the items in the post is about "Support when you feel like giving up." 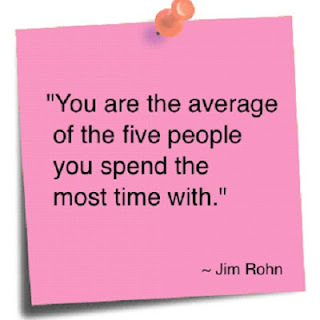 Another post resonated with me at the same time, because Jim Rohn used to say that you are the average of the people you hang around with. Build a better tribe (or a master mind group) to hang around with so that you can grow, improve, stretch, be supported, support others, mentor, be mentored. Michelle Welsh reminds me to find people better than me to hang around with so that you can learn and grow (and not always be the teacher and coach). Michelle writes about building your Dream Team. One of my coaches - who got me into master mind groups, a concept that Napoleon Hill developed - used to say that Wealth was a Team sport and you can't do alone. You need a CPA, a book keeper, a Financial advisor, a lawyer, a partner/co-founder/spouse, a mentor, etc. She's write and the post is short. Forbes has another version of this with its article the 6 People you need in your corner. All this is to say that you should surround yourself with people who will support your success.